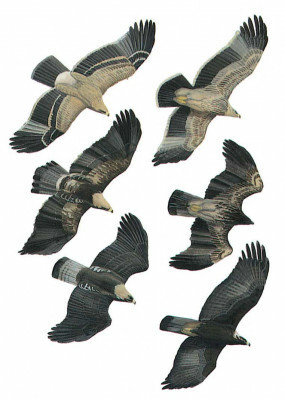 In adult, plumage is blackish-brown with contrasting yellow-white hindneck, pale uppertail with broad black band, white ‘shoulder-braces’ (hard to see), pale ventral region, darkish primaries above, parallel-edged wings held flattish and, often, closed narrow tail when soaring. Juvenile has dark-streaked breast forming pectoral band which contrasts with unstreaked yellow-buff rear-body, and distinct pale wedge on inner primaries below, yellow-brown upperparts show 1–2 complete whitish bars on coverts and lower back and rump usually creamy-white; lacks white band through underwing of young Steppe. Immature from below, mottled blackish-brown and yellowish with rear-body clearly paler; adult head- and tail-pattern start to show early. Rather long-winged with ample hand, deep-fingered wing-tip (long 4th primary), well-protruding head and relatively long tail; juvenile has broader, more ‘S’-curved wings. Wings sometimes slightly lifted when soaring, but arched during fast glides; wing-beats slightly more flexible than Steppe’s.